I enjoyed doing last week’s post, so I’m back with the Book Beginnings (hosted over at Rose City Reader) and Friday 56 (hosted at Freda’s Voice) memes for this week! There was a boy called Eustace Clarence Scrubb, and he almost deserved it. His parents called him Eustace Clarence and his schoolmasters called him Scrubb. I can’t tell you how his friends spoke to him, for he had none. It seemed to Lucy that a great valley in the sea opened just before their bows, and they rushed down into it, deeper down than she would have believed possible. A great grey hill of water, far higher than the mast, rushed to meet them; it looked certain death but they were tossed to the top of it. Then she ship seemed to spin round. A cataract of water poured over their deck; the poop and forecastle were like two islands with a fierce sea between them. 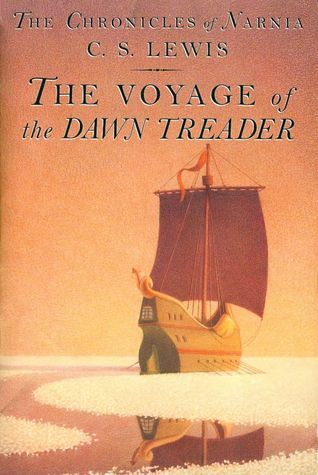 As with the other books in the Chronicles of Narnia, The Voyage of the Dawn Treader is full of great adventures! We’re excited to start the next installment.